As we rest our minds and bodies to the earth, in eternal death, do we make a passage to a new realm? Perhaps this great sleep is a dream of sorts, as we begin to drift off into the lone wanderings of the soul, through the inner worlds until the ultimate dissipation into darkness. In the Forest of Eternity we glimpse this infinite wilderness of the mind, wherein the explorer finds no true home, no resting place in his long travel. The journey shall continue indefinitely, even as the shimmering heavens make their last sink into the inky black ocean. But there is a beyond. This work seems to suggest it, that there is a majestic metaphysical realm that our derelict souls can find respite, in the grandiose temples of the afterlife, crafted through imagination. Perhaps I'm stretching a bit here. I'll admit, two works of Depressive Silence I've long considered adding asterisks to in the list, which is my way of indicating that they represent my personal ideal of dungeon synth. As nice as these works are, perfectly fitting the paradigm of the genre, somehow they're lacking that extra bit to make me worshipful. Don't get me wrong, I think every person with an interest in this genre needs to hear these demos, as they're a spot-on example of the style, only they come slightly short for me. I'm focusing more upon "Demo III" for the purposes of this review, however both this one as well as "The Darkened Empires" are very similar in style, to the point that combining the works wouldn't cause any surprises. It's definitely best as background music. 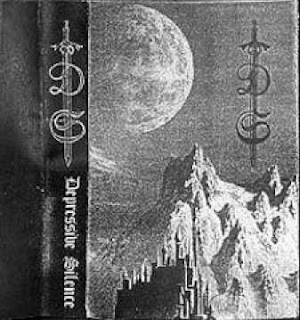 I hate to speak ill of Depressive Silence, because it is undeniably a strong example of dungeon synth, but in my many listens of this demo, there doesn’t seem to be much beneath the prettiness. It's great for pushing oneself into a mindset of fantasy, or for a somewhat distracted escape, but it's not quite distinctive enough, and lacks the truly captivating qualities that might make it great. While it does often shift between serene and intense moments, it still always maintains a static tone of marble beauty. It's as if one is a ghost, drifting through an ancient city where all is perfectly preserved, except for the life. The keyboards are the clear and iconic early 90's digital machines, the very traditional dungeon synth instrument. The crystals, strings, and harps shimmer, soaked in reverb, creating a hazy sense of unreality as the white columns glisten in the starlight. I'd recommend Depressive Silence to a new dungeon synth listener far more readily than a more challenging, but also more interesting artist such as Abandoned Places, since Depressive Silence is readily accessible, quite beautiful, epitomizes the sound of dungeon synth, and was created in a time when such a sound was still very new. Unfortunately, however, it lacks depth. While it is a good work, it is not quite great, getting near enough for a hint of that mysterious other realm, but not being able to fully crossover into it.